On Windows, download Win32ImageWriter, rename the .iso to .img, format the thumb drive and use Win32ImageWriter to copy the image to the drive. You might also install to an USB thumb drive of at least 2GB size by booting from CD/DVD. In this case the thumb drive will be partitioned into two volumes: The first volume will be FAT32 and accessible from Windows, the second partition will be EXT2 and only accessible from linux. During installation you can decide whether to create an encrypted container that will continue your home directory. This is useful to store shell scripts, book marks, logins for web pages etc. There are three boot options that start a VNC server instead of a local X-Server. Unsafe local VNC access Allow anyone to connect on port 5900 without a password. Since everyone has root rights, you should use this option only in trustworthy environments. Reverse VNC VNC is used to export the desktop via an outgoing connection instead of allowing incoming connections, you might want to use this feature in cases where it is impossible to accept incoming connections (some DSL providers, NAT behind NAT when connected via a 3.5G router). Another new feature is the Cheatcode kexec=http://server/path/kexec.conf. If the cheatcode is present, said config file will be downloaded and the kernel and initrd mentioned will be booted. Just take a look at this config to see how it works. Just one kernel is allowed, multiple initrds (one per line) will be concatenated. Make sure that append is on the last line. Currently the boot menu contains eight kexec entries to kickstart internet installation of current versions of openSUSE, Debian and Ubuntu (LTS and current stable) – all 32 and 64 bit. Eventually an entry to boot the latest bleeding edge version of LessLinux Search and Rescue will follow. You might notice the directory /lesslinux/blob. This new directory is intended to take files that are only distributed as binary only large objects. My intention is to use this directory to keep non free software out of the SquashFS containers. Users will be given the opportunity to add non-free components in a very simple way. Currently the blob directory can only be used to install Adobes Flash player instead of the free Gnash player. Either place the packed install_flash_player_10_linux.tar.gz or the unpacked libflashplayer.so in the blob directory. Upcoming builds will use the blob directory to integrate closed source virus scanners and similar stuff. 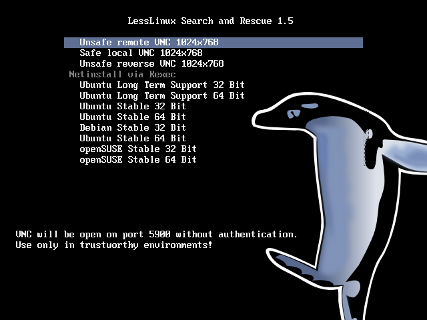 You can download all source packages from LessLinux Search and Rescue 1.5 and previous builds from distfiles.lesslinux.org. An archive containing all build scripts is available from download.lesslinux.org/src/. Instructions on building your own LessLinux based system will follow in the next days. Thanks to Tobias Langhammer, a friend of mine from university days, LessLinux has a new logo (its first logo to be honest). The logo shows a flying penguin (OK, a jumping penguin) and is modeled after a photograph. The logo is available under the Creative Commons Share Alike 3.0 license. I currently prefer the version with the dark background and I encourage using it for press stuff. Lighter colored versions will follow in a separate blog post. There are currently no mailing lists. You can ask questions by writing to support@mattiasschlenker.de. This Email is primarily used for paying customers, so please be so kind to wait a day or two for an answer. I might invoice you with any sum from €5 upwards – either for support or “programming time”. If you have a EU VATIN (Value Added Tax Identification Number), the invoice will be without German VAT, and since transfers within the EU are fast and cheap, it also makes sense for small amounts. If you are located outside the EU or European Economic Area, the invoice also will be without German VAT, but the money transfer might cost significantly more, so it might just make sense for amounts of €50 upwards. Depending on the legislation in your country, invoices for development/support might be fully tax deductible. Since LessLinux is highly customizable for many tasks like rescue, backup, distribution of images, demo systems for web based software, just ask for a quote if you have an idea. If you are located within the EU, I might also write an invoice, but in this case I have to add German VAT (currently 19%). If you are outside the EU, transferring small amounts of money just does not make sense. I will investigate methods like PayPal or Amazon gifts in the near future. In the meantime: Since I like dry red wine you might send me a bottle of a local wine or – if you live north of the 51st parallel – some local beer. Dieser Eintrag wurde am Monday, January 10th, 2011 um 2:43 pm geschrieben und ist unter Cheatcodes, Releases, Screenshots abgelegt. Antworten können Sie mit dem RSS 2.0-Feed verfolgen. F�r diesen Artikel sind weder Trackbacks noch Kommentare erlaubt.